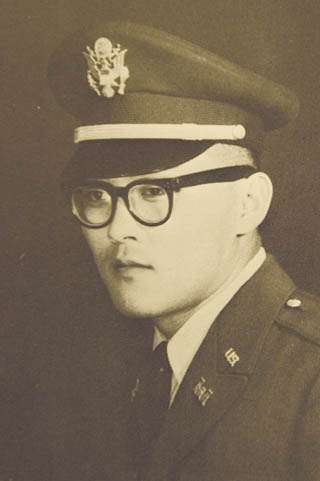 An Army annual shows Jimmy D. Nakayama. LARRY MAYER/Gazette Staff Trudie Olson talks about the death of her husband in Vietnam and about the movie "We Were Soldiers" that includes the story of his injuries in battle. Trudie Olson Nakayama and her new baby Nikki are photographed with her mother-in-law Satako at the funeral for Jimmy Nakayama in 1965. For 36 years, Trudie Olson didn't know that her husband, as he was evacuated from a Vietnam battlefield where he had been mortally wounded, spoke of her and the child he never saw. "Tell my wife and baby I love them," he gasped to United Press International reporter Joe Galloway as Galloway helped load him onto a helicopter. Olson's husband - Jim Nakayama was his name - died three days later, Nov. 17, 1965, on the way to a hospital in the states. Olson knew very little about what happened in the Ia Drang Valley the day her husband died until a few weeks ago, when friends from her native Idaho began calling about a recently released movie, "We Were Soldiers," starring Mel Gibson. The movie is based on a book Galloway wrote in 1993 with the commanding officer at Ia Drang, retired Lt. Gen. Hal Moore. Nakayama's part is told in a few minutes of screen time near the climax. "I debated quite a while whether I even wanted to watch it," said Olson, who lives in Billings now. "For the first couple of weeks after I found out about the movie, I was a wreck. I cried. I couldn't sleep at night. I was plunged into the past as if all these years hadn't gone by. But I had such a compelling need to know what he was faced with." So she went to the West End theater where the movie was playing, accompanied by a friend who had seen the film already. The friend could tell her when to turn away. Galloway vividly recalled the 22-year-old soldier, whom he had met on the day of the battle, Nov. 14. Scenes depicting their encounters are some of the most riveting in a very intense movie. In "We Were Soldiers," Galloway introduces himself to Nakayama, and Nakayama tells him that his baby is being born that day. Actually, Nikki, their daughter, had been born Nov. 7, but her father didn't know she had arrived a little early, Olson said. Not long after the conversation, two U.S. warjets providing air support for the soldiers roar overhead. Two canisters drop from the first plane. They seem to fall in slow motion, just as those who were there described. They hit the American position in a ball of fire, and Nakayama ignites. "Now those men were dancing in the fire," Galloway wrote in the book. "Their hair burned off in an instant. Their clothes were incinerated … . When the flames died down we all ran out into the burning grass. Somebody yelled at me to grab the feet of one of the charred soldiers (Nakayama). When I got them, the boots crumbled and the flesh came off and I could feel the bare bones of his ankles in the palms of my hands." The movie adheres to the description in the book, although Galloway told Olson recently that while the movie shows him alone carrying her husband off the field, he and a soldier together carried Nakayama. "It was incredibly traumatic," Olson said. She cried through the whole movie, and sobbed when her husband's story was depicted. "But I'm glad I went," she said. "I'm glad that I understand what he was faced with there. I'm glad to know his last thoughts were of Nikki and me. I'm glad to know he was a hero, and I'm glad other people will know now, too." "I knew he had been hit by napalm, and I knew enough about napalm to know it would be pretty terrible. I always hoped that he would have been unconscious after he was hit. But I learned through the book and the movie that he was not." Trudie and Jim were sweethearts in Rigby, Idaho, during her junior and senior years of high school. Jim, a few years older, had been a high school football star, a brilliant student and a boy everybody liked. Olson, who now goes by her maiden name, said they married when she turned 18. Ten months was all they had together, and for the last few months of their marriage, Jim was in Vietnam. Jim, a second lieutenant in the National Guard, had joined the regular army. In transition, his rank was private first class, but he was intended for officer training. His commission came through a week after his death. The Nakayamas moved to Fort Benning, Ga., after he joined the army. Just before he left for Vietnam, he drove his wife to Denver to rendezvous with her parents. She would stay with them in St. Anthony until the baby was born. She was seven months pregnant. "The whole idea of being a father was a huge deal to him," Olson said. "I always regretted that he didn't know she had arrived. His letters were full of the baby. Had it been born yet? Did we have a boy or a girl? Our lives revolved around the future, what we would do when he got back." He didn't dwell on it, but Jim had premonitions that they would not see each other again. The letter he was writing to her from the battlefield contained uneasy references to the uncomfortable feeling, she said. Singed around the edges, the letter was delivered to Olson with the rest of his belongings. "When he died I felt like everything I knew and believed about life had been erased," Olson said. "There aren't any words to describe what that felt like. It was completely devastating." Because of Nakayam's terrible burns, the body arrived in a closed casket. His 18-year-old widow didn't see the remains. "Part of me hoped and tried to believe that they had made a mistake," she said. "Maybe he was MIA or a POW. For two or three years after he died when I heard a knock on the door, I always hoped I would see him there telling me that they had made a mistake." Olson's mother persuaded the young war widow to start college in Southern California, "even though I didn't feel like it and didn't want to," Olson said. After graduation, she worked various jobs before joining the Bureau of Land Management in 1977. Lately she's started to feel that the hole in her life is at last being filled. For the first few years after Jim's death, she often felt that Jim was with her. "I feel sometimes that he is with me again," she said. "It's a fairly profound thing, and it's comforting." A day after viewing "We Were Soldiers," Olson got on the Internet to try to locate Galloway. She wrote him on a Thursday through the book's publisher. He sent her an e-mail three days later. Galloway told Olson he had been trying to find her for years, and was more than willing to share with her his experiences with her late husband. "I learned more than I ever knew before," she said. "Thirty-seven years ago I was never able to get information or locate anyone someone who was with him. To have this information now and to be able to contact people who were with him, I have a sense of closure I've never had before." Galloway gave her the names and telephone numbers of two others who were there the day the napalm hit. She plans to call them, as well as a helicopter pilot identified in the movie as Too Tall. The pilot remembers her husband well, according to Galloway. She and her daughter are arranging to attend a reunion of Ia Drang combatants next November. There, she hopes to meet Galloway and others who may know something of her husband. Most of the information delivered to her by telegram in the middle of the night at her parents' home in St. Anthony, Idaho, in November 1965 was wrong. The brief message said he had been killed in an enemy mortar attack. After Olson's father prodded an Idaho senator for more details, a follow-up telegram arrived, telling her that he had been killed by friendly fire - napalm dropped too close to surrounded and outnumbered American forces. Olson said she tried to get more information from the government, or some way to contact someone who was at the battle. Nothing came of her efforts. So she grieved, raised the daughter born 10 days before her father's death, had a second brief marriage and a son and moved to Billings as a public affairs specialist for the Bureau of Land Management. "I don't know that I did adjust," Olson said. "It was sort of more like trying to survive. Once he was gone, there was part of me that didn't want to go on. I remember thinking 'Thank God for this baby. I still have a part of him.' "